Takabisha’s record breaking drop angle, at 121 degrees. Takabisha is the steepest coaster in the world with a drop angle of 121°. 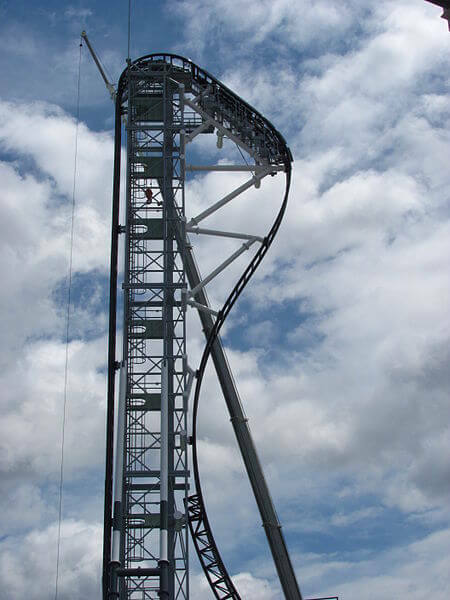 The coaster is listed in the Guinness World Records for the steepest steel roller coaster. The name of the coaster, Takabisha, translates to ‘high flying car’ in English. The coaster’s inversions consist of a banana roll, a corkscrew, a dive loop, an inline loop, an immelmann loop, a heartline roll, and a large inverted top hat.